At Fancy Feet, we pride ourselves on hosting memorable birthday parties for children of all ages. 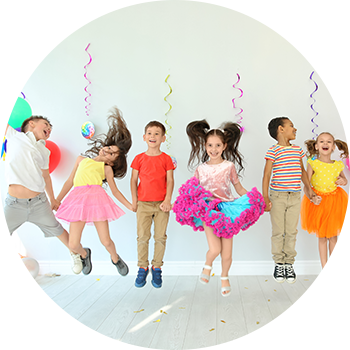 When you book a birthday party at one of our New York studios, you’ll be able to choose between a dance party or gymnastic party. Our dance parties are filled with ballet, jazz, and hip hop (or a combination of each), while our gymnastic parties will have your child tumbling and cartwheeling around the room with joy. Book your next party at our Allerton, Crosby, Unionport, or Fleetwood studio today! Why Host Your Child’s Birthday Party With Fancy Feet? Fancy Feet has been providing memorable Birthday Parties for decades. You can choose a DANCE PARTY filled with ballet, jazz and hip hop or a combination of both, moving to today’s music in a fun new way. If you choose a GYMNASTIC PARTY they will be tumbling and cartwheeling around the room. Either way your child is guaranteed to have fun and so are his or her friends. Find out more about what your party will include by checking out the inclusive list below and calling us to schedule your big party. Below you will find the list of what your party includes. CALL NOW to book your party! *Please note parties are usually held on Sunday due to class schedule. The party is for 12 children. Additional cost for more children. A down payment of HALF is due when booking a date. Call studio location for Pricing information.